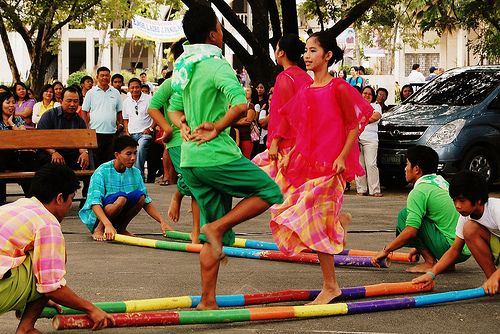 Tinikling is one of the most well known dances in the Filipino culture and one of the most popular types of dance in the Philippines. Tinikling involves two people beating, tapping, sliding bamboo poles on the floor against each other in coordination with one or more dancers who step over and in between the poles in a dance. The dance originated in the Visayan islands in the central Philippines as an imitation of the tikling bird dodging bamboo traps set by rice farmers. This dance imitates the movement of the tikling birds as they walk between grass stems, run over tree braches, or dodge bamboo traps set by rice farmers.